The 2018 Honda Fit Has a New Look! One of the most respected subcompact cars on the market has been redesigned for 2018, and adventurous drivers in West Michigan are taking notice! 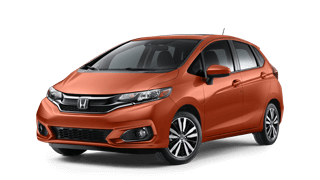 The 2018 Honda Fit is bolder, sportier, and more aggressive-looking than its 2017 model, and folks who want a fun, fresh vehicle that offers plenty of utility are sure to be enamored with its new design. What’s more, this year’s Fit is affordable for younger drivers and drivers on a budget, especially when one considers how many standard features they’ll receive for the price. Curious buyers can learn about the changes to the new Fit by reading on below! Every 2018 Fit model has been shaped with a lower, wider stance than the models of previous years. Each trim will also be decorated with new front and rear fascia, as well as a sharp new two-piece grille. Helios Yellow and Orange Fury have been added to the Fit’s cast of available color options, and its lithe, aerodynamic form helps to ensure that you’ll always make an impressive entrance. On top of all this, we should note that the engineers and designers at Honda have added a Sport trim to this year’s Fit lineup. According to a recent preview at Motor Trend, Sport models offer 16-inch gloss-black aluminum alloy wheels, orange pinstripes, a chrome exhaust pipe, a rear diffuser, and an aero-form front spoiler! The features that come equipped in the 2018 Fit are anything but superficial. Starting this year, Honda Sensing safety technologies will become available on every Fit trim, and as before, every trim level includes a 60/40-split folding Magic Seat, a leather-wrapped steering wheel and shift knob, and more. The 2018 Honda Fit’s bold new design is sure to excite the senses of West Michigan drivers, and you can get up close and personal with the new Fit by taking it for a test drive at your local West Michigan Honda Dealer! Schedule your visit or get more information by reaching out to one of our representatives today. Be sure to check out our current offers and financing options to get an even better deal on this year’s most exciting subcompact. 0 comment(s) so far on The 2018 Honda Fit Has a New Look!